Our entire line of Shakerstix™ drumsticks were created to give every drummer or percussionist the ability to add that smooth, rhythmic shaker sound to their playing style without sacrificing creativity. 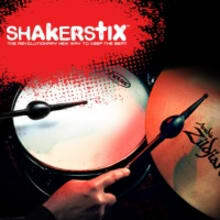 Whether it be Jazz, Rock, Progressive, Hip-Hop, Latin or “Unplugged,” Shakerstix™ is the one stick no drummer should be without! We assemble and distribute our sticks from our location in Moorpark, California.